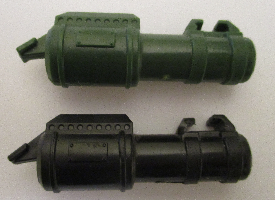 This page contains missile launchers and similar weapons that can be loaded with separate projectiles. Most prominently, this includes the many handheld spring-loaded launchers, which are together at the end of the list. 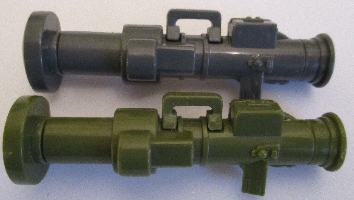 Launchers with backpack pegs are, however listed on the backpacks page. The projectiles themselves are here. in olive with Backblast, the original version on the 1989 single card. in light grey (2 copies) with Metal-Head, the original version on the 1990 single card. in light grey with Rampart, on the 1990 single card. in dark grey with Destro, in the 2005 General Mayhem: M.A.R.S. Invades! convention set. in silver with Incinerator, on the 1991 Wave 1 single card. in black with Effects, on the 1994 Star Brigade card. in light green with General Flagg, the brown-jacket version on the 1992 Wave 2 single card. in light green with General Flagg, the black-jacket version on the 1993 Battle Corps card. in gold with Firefly, the grey pads version on the 1992 Wave 2 single card. in black with Firefly, the black pads version on the 1993 Battle Corps card. in black with Major Bludd, the silver-vest 25th-style version in the 2008 The Pyramid of Darkness DVD pack. in black and tan with Sergeant Bazooka, the 25th-style version on the 2008 Wave 9 single card. in black and grey with Snow Serpent Trooper, the silver-buckle combat version in the 2008 Arctic Assault Squad seven-pack. in dark green (2 copies) with Heavy Duty, the original version on the 1991 Wave 1 single card. 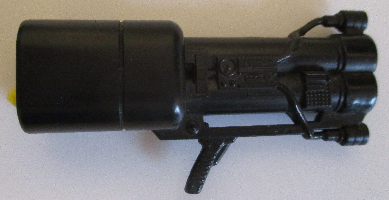 in black (2 copies) with the AH-74 Desert Apache, released in 1992.
in black (orange trigger) with Grunt, the missile launcher version on the 1991 Wave 2 single card. in dark blue (orange trigger) with Mercer, the bearded version on the 1991 Wave 2 single card. in blue (orange trigger) with Cobra Commander, the glider version on the 1991 Wave 2 single card. in black (yellow trigger) with Wet-Suit, the yellow version on the 1992 Wave 1 single card. in black (yellow trigger) with Wet-Suit, the orange version on the 1993 Battle Corps card. in blue (black trigger) with Roadblock, the recalled version on the 1992 Wave 1 single card. in black (yellow trigger) with Big Bear, the green version on the 1992 Wave 1 single card. 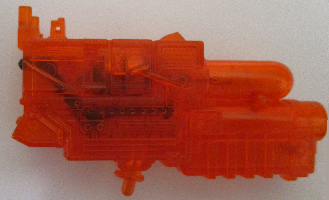 in black (red trigger) with Destro, the disc launcher version on the 1992 Wave 1 single card. in black or pink (black trigger) with Destro, the dark red version in the 1997 Cobra Command Team three-pack. in black (blue trigger) with Gung-Ho, the green-vest version on the 1992 Wave 2 single card as well as his reissue on 1993 Battle Corps card. 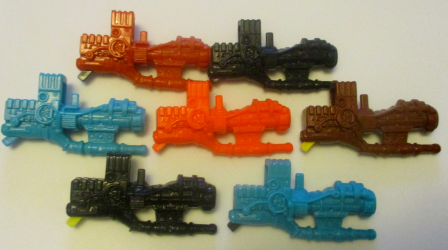 in orange (black trigger) with Leatherneck, the giraffe-pants version on the 1993 Battle Corps card. in black (blue trigger) with Gung-Ho, the red-vest version on the 1993 Battle Corps card. in dark blue (yellow trigger) with Barricade, the blue version on the 1992 Wave 2 single card. 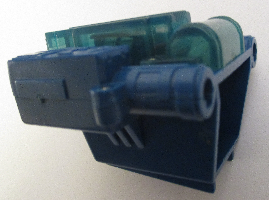 in dark blue (yellow trigger) with Barricade, the orange version on the 1993 Battle Corps card. in gold (light green trigger) with Colonel Courage, on the 1993 Battle Corps card. in blue (red trigger)-brown with Wild Bill, the black-pants version on the 1992 Wave 2 single card as well as his reissue on 1993 Battle Corps card. in blue (red trigger)-brown with Wild Bill, the white-pants version on the 1993 Battle Corps card. in silver with Eel, the blue version on the 1992 Wave 2 single card. in clear green with Bullet-Proof, the original version on the 1992 Drug Elimination Force card. in clear blue with Mutt, the D.E.F. version on the 1992 single card. in clear orange with Cutter, the D.E.F. version on the 1992 single card. in clear yellow with Shockwave, the D.E.F. version on the 1992 single card. in clear red with Headman, the black version on the 1992 single card. in red with Mutt, on the 1993 Battle Corps card. in clear purple with Headhunter, the original version on the 1992 single card. in purple with Headhunter, the green-trim version on the 1993 Battle Corps card. 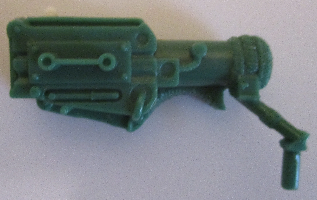 in teal (green trigger) with Bazooka, the fishing-hat version on the 1993 Battle Corps card. in blue (red trigger) with Outback, the blue version on the 1993 Battle Corps card. 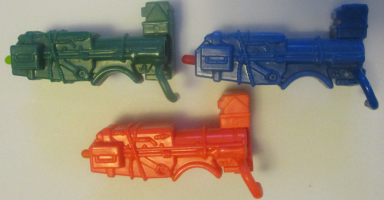 in blue (red trigger) with Outback, the green version on the 1993 Battle Corps card. in teal (black trigger) with Cross-Country, on the 1993 Battle Corps card. 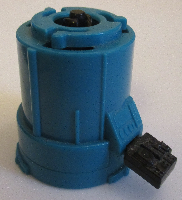 in teal (black trigger) with Roadblock, the recalled version reissued on 1993 Battle Corps card. 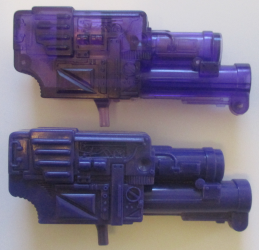 in teal (black trigger) with Roadblock, the purple version on the 1993 Battle Corps card. in red-brown (white trigger) with Snow Storm, the orange version on the 1993 Battle Corps card. in red-brown (white trigger) with Snow Storm, the blue version on the 1993 Battle Corps card. in red-brown (black trigger) with Snow Storm, the grey version on the 1994 Battle Corps card. 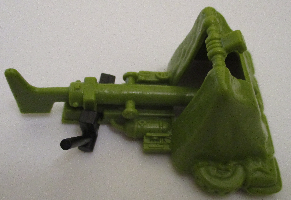 in green (white trigger) with Iceberg, on the 1993 Battle Corps card. 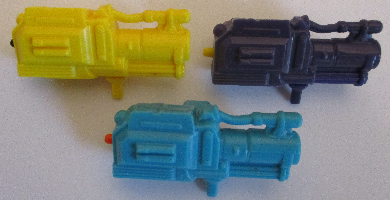 in black (yellow trigger) with Beach-Head, the blue version on the 1993 Battle Corps card. 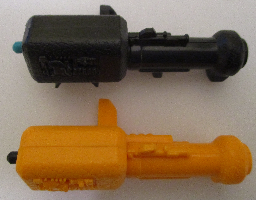 in black (yellow trigger) with Beach-Head, the yellow version on the 1994 Battle Corps card. 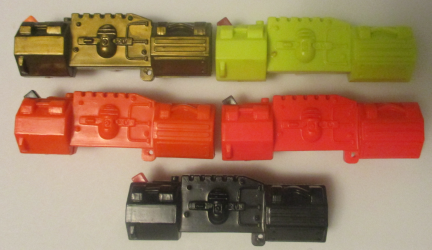 in black (light green trigger) with H.E.A.T. Viper, the green version on the 1993 Battle Corps card. 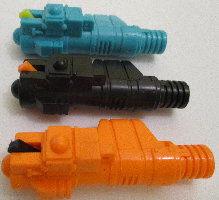 in black (orange trigger) with Night Creeper Leader, the orange version on the 1993 Battle Corps card. 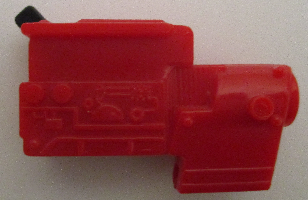 in red (neon red trigger) with T.A.R.G.A.T., the gold version on the 1993 Star Brigade card. in neon green (orange trigger) with M. Bison, the red version on the 1993 Capcom Street Fighter II single card. in red (black trigger) with Metal-Head, on the 1994 Battle Corps card. in gold (black trigger) with Night Creeper Leader, the purple version on the 1994 Battle Corps card. 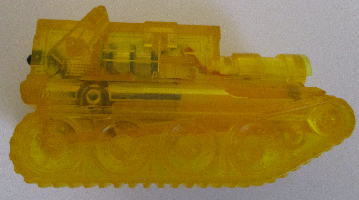 in yellow (black trigger) with Alley Viper, the yellow version on the 1993 Battle Corps card. in yellow (black trigger) with Viper, on the 1994 Battle Corps card. in purple (yellow trigger) with Dr. Mindbender, on the 1993 Battle Corps card. in blue (orange trigger) with Alley Viper, the orange Battle Corps version on the 1994 single card. in gold (black trigger) with Duke, on the 1993 Battle Corps card. 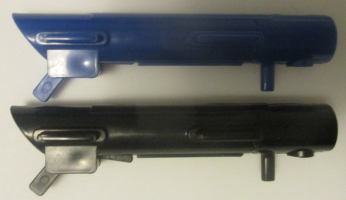 in gold (black trigger) with Payload, the blue version on the 1994 Star Brigade card. 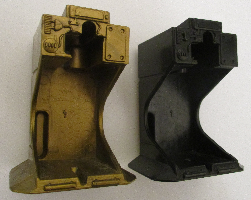 in gold (black trigger) with Payload, the white version on the 1994 Star Brigade card. in orange-red with Frostbite, on the 1993 Battle Corps card. in orange with Gung-Ho, on the 1993 Mega-Marines card. 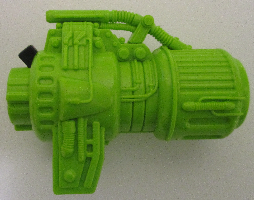 in gold (neon red trigger) with Payload, the green version on the 1993 Star Brigade card. 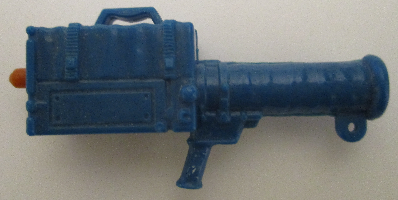 in dark blue (gold trigger) with Roadblock, the white version on the 1993 Star Brigade card. in red-orange (black trigger) with Ozone, the brown version on the 1993 Star Brigade card. 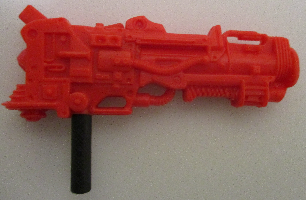 in red-orange (black trigger) with Ozone, the grey version on the 1993 Star Brigade card. in black (brown trigger) with Stalker, on the 1994 Battle Corps card. in silver (black trigger) with Roadblock, the orange version on the 1994 Star Brigade card. in orange (black trigger) with Ozone, the red version on the 1994 Star Brigade card. in red-brown (black trigger) with Keel-Haul, on the 1993 Battle Corps card. in blue with Mirage, the original version on the 1993 Mega-Marines card. in black or brown (yellow trigger) with Countdown, the blue version on the 1993 Star Brigade card. 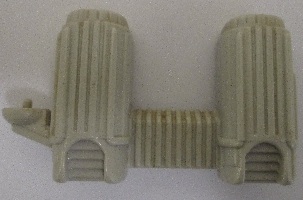 in black (light grey trigger) with Ice Cream Soldier, on the 1994 Battle Corps card. in light blue (black trigger) with Countdown, the grey version on the 1994 Star Brigade card. in yellow (black trigger) with Crimson Guard Commander, on the 1993 Battle Corps card. in red (black trigger) with Cobra Commander, the black hooded version on the 1993 Battle Corps card. in yellow (red trigger) with Eel, the purple version on the 1993 Battle Corps card. in pink with Mega-Viper, on the 1993 Mega-Marines card. in yellow with Cyber-Viper, on the 1993 Mega-Marines card. in red (black trigger) with Bio-Viper, on the 1993 Mega-Marines card. in orange (gold trigger) with Robo-J.O.E., on the 1993 Star Brigade Armor-Tech card. in silver (yellow trigger) with Rock 'n Roll, on the 1993 Star Brigade Armor-Tech card. in red (black trigger) with Cobra B.A.A.T., on the 1993 Star Brigade Armor-Tech card. 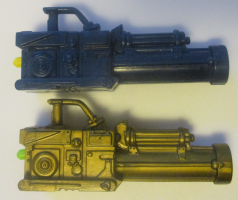 in gold (orange trigger) with Astro Viper, the blue-green version on the 1993 Star Brigade card. in yellow (dark red trigger) with Gristle, on the 1993 Battle Corps card. 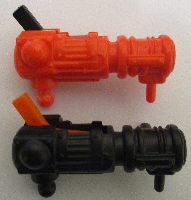 in red-orange (black trigger) with Headhunter Stormtrooper, the black version on the 1993 Battle Corps card. in orange (black trigger) with Blanka, the green version on the 1993 Capcom Street Fighter II single card. in red (black trigger) with Balrog, on the 1993 Capcom Street Fighter II single card. 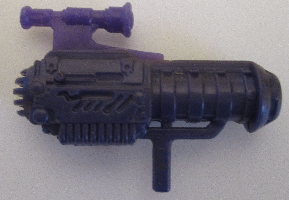 in black (red trigger) with Major Bludd, the purple version on the 1994 Battle Corps card. in light blue (yellow trigger) with Law, on the 1993 Battle Corps card. 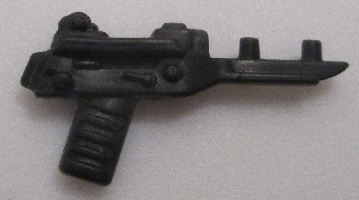 in black (red trigger) with Long Arm, the original version on the 1993 Battle Corps card. in orange (black trigger) with Guile, the green version on the 1993 Capcom Street Fighter II single card. 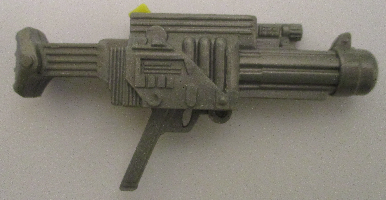 in black (yellow trigger) with Mace, on the 1993 Battle Corps card. in orange (dark blue trigger) with Muskrat, on the 1993 Battle Corps card. in orange (black trigger) with Flint, on the 1994 Battle Corps card. 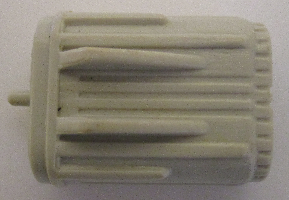 in silver with Dial-Tone, on the 1994 Battle Corps card. 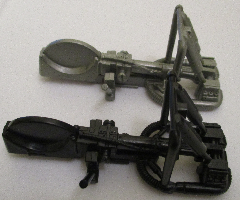 in silver (black trigger) with Shipwreck, the dark grey diver version on the 1994 Battle Corps card. in black (red trigger) with Lifeline, on the 1994 Battle Corps card. in red-orange (black trigger) with Duke, on the 1994 Star Brigade card. 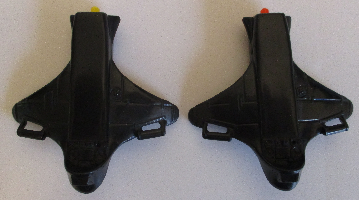 in black (orange trigger) with Sci-Fi, the yellow version on the 1994 Star Brigade card. 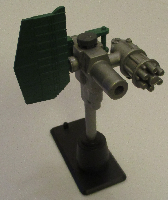 in light green (black trigger) with Cobra Blackstar, on the 1994 Star Brigade card. in olive (black trigger) with Action Soldier, in the 1994 single box, as well as his reissue in the Original Action Team five-pack. 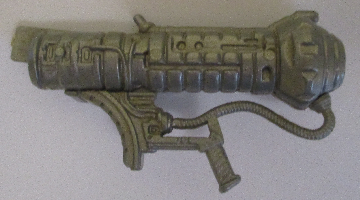 in light green (black trigger) with Action Marine, in the 1994 single box, as well as his reissue in the Original Action Team five-pack. 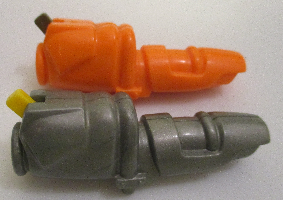 in silver with black base and green shield with Hi-Tech, in the 2004 Wave 1 two-pack with Dr. Mindbender. in tan (green trigger) with Roadblock, the Walmart version in the 2004 two-pack with Cobra C.L.A.W.S. 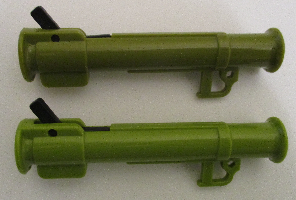 in tan (green trigger) with Duke, the Walmart version in the 2004 two-pack with Iron Grenadier. 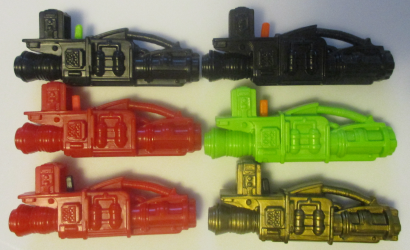 in tan (green trigger) with Gung-Ho, the Walmart version in the 2004 two-pack with Neo-Viper. in green with Checkpoint, in the 2006 Plague Troopers vs. Steel Brigade six-pack. in green with Zap, in the 2007 Tanks for the Memories convention set. in black with Cobra B.A.T., the red-face 25th-style version in the 2008 Arise, Serpentor, Arise! DVD pack. 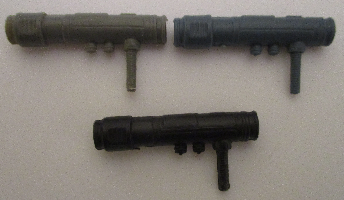 in grey (black trigger) with Cobra Trooper, the red Resolute version in the 2009 G.I. Joe Resolute five-pack.